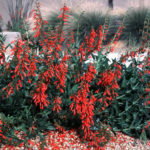 The Firecracker Penstemon is a great plant in our Arizona desert for winter color. It has dark green foliage with deep red/orange flowers that bloom late winter to spring. This plant attracts hummingbirds and other birds. It is an evergreen plant that has low litter and is great poolside. It grows to 2’x 2′ and can be grown in full sun to partial shade and is hardy to 0 degrees. This plant looks great planted next to boulders or with contrasting colored plants like the Angelita Daisy or Desert Marigold.